I ordered this piece delivery was 3 days pritty quick, but the colour was a lot lighter than expected, if you buy this pice thinking it a dark brown with blonde it's more of a light brown so go for a darker colour. Arrived in 4 days, from Newcastle to Devon. Feel lovely. I have very thick hair so was worried they wouldn't be thick enough, but they are perfect. The wave is a little unrealistic and doesn't look right when they are behind you. Haven't washed them yet as only received yesterday, the bonds aren't quite tight enough so hair does come out pretty easily. 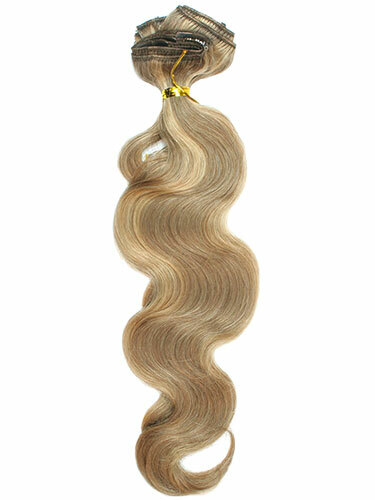 the color is great it blends in very well, i love this hair , the quality is great, ! thumbs up ! I bought this for the first time, I just love them!! they are so soft and natural. :-) The only negative thing is the strong smell they had when they are new. I have washed them as I received them with this I got the prove they are real good. I appreciate their quality and density of hair. Many thanks, hairtrade. I found that one pack was plenty for my hair, the loose waves of these extensions are amazing, and look so much more natural than curling straight extensions. cant live without them now!! Brilliant, they were deleivered within 2 days and they look amazing! definatly a good buy! I had tried some of your hair extensions n they look fantastic however it would be better if you can have some demo/flowchart usage for new comers. Not really alot of hair in one packet, I needed at least two packs to make it look natural and not so 'stringy', three packs if you're hair is really thick. Quite an expensive way to do it really. I love the hair extensions does it come with other style? i have shorter straight hair right now.. but i want my long hair back and i was thinking of getting wavy extensions for something different... do you think it will look weird with straight hair??? i bought this for the second time now. i just love them!! they are so soft and natural. the last extensions i had for 4 months, so if i buy them 3 imes a year it's not that much:) the only thing i don't like it's the smell when they're new, that's why i wash them as soon as i get them. and then there is no point in ordering wavy ones:)) next time i'll order straight ones cause they are the same( my friend has them). i just love this qulity nd density of these hair.thanks, hairtrade. I bought this product because i have sort of pamela anderson bleach blonde long wavy hair and wanted to add more volume. i bought colour 24 because it looked like a good match but i cant believe how dark it is, it is more like a honey golden blonde than a bright creamy bleach blonde, so don't let the photo fool you. The quality of the hair however is fantastic albeit abit silky compared to my porous bleached hair however blends in well. I am going to swap my order for colour 613. I would advise phoning the hotline to ask what colour would suit your hair colour before ordering, if you can describe it properly that is. I cant wait to get my new ones!!! Thanks HairTrade!! !